EAT THE DOCUMENT is a documentary of Bob Dylan's 1966 tour of the United Kingdom with the Hawks. It was shot under Dylan's direction by D. A. Pennebaker, whose groundbreaking documentary Dont Look Back chronicled Dylan's 1965 British tour. The film was originally commissioned for the ABC television series ABC Stage 67. Though shooting had completed for the film, Dylan's July 1966 motorcycle accident delayed the editing process. Once well enough to work again, Dylan edited the film himself. ABC rejected the film as incomprehensible for a mainstream audience. It has never been released on home video and prints are rarely screened in theaters. 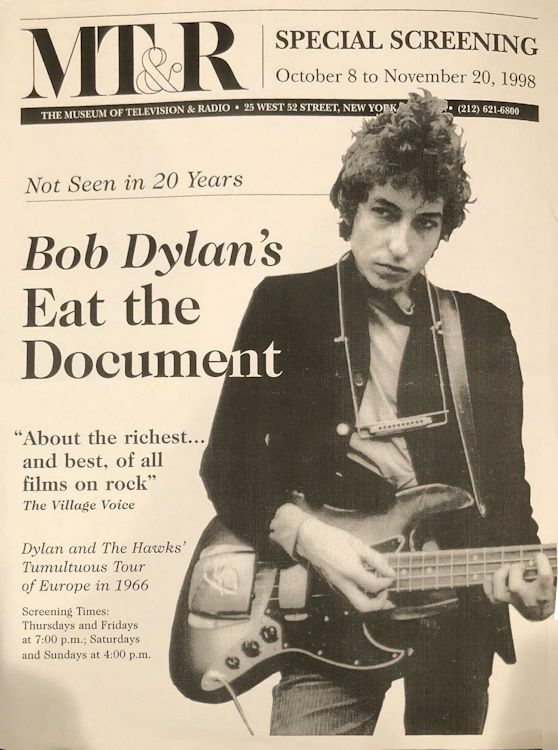 Some footage from Eat the Document was used in Martin Scorsese's 2005 documentary on Bob Dylan, No Direction Home and 3 song excerpts are Special Features on the DVD. .